Government schools differ from the real world in so many ways. There are no grades where you move with your age group to the next level — all 40 year olds are not in the 40th grade. There are not a fixed set of subjects determined by some central planner and whether local teachers know the subjects. Now you can experience some freedom in both areas through the online education website – Khan Academy. 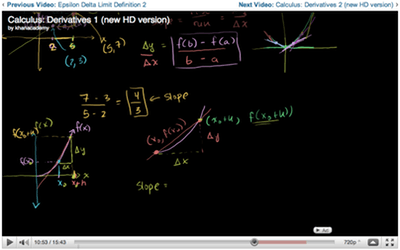 The Khan Academy has thousands of free video tutorials on math, chemistry, biology, and many others topics. The site’s creator recorded the first videos to tutor his niece. Initially he would tutor her during a online phone call. When they couldn’t talk by phone, he would record his tutorial and post it to YouTube. His niece preferred YouTube versions because she could rewind difficult parts and fast forward through easy areas. Wouldn’t you like to fast forward through boring government school lectures? 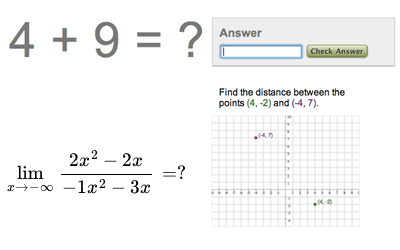 Khan Academy also has exercises for many topics, mostly math. The site recommends you correctly answer 10 consecutive questions before moving on to another topic. This shows mastery, and contrasts with gov’t education must consider 70 percent to be good, since it’s an assembly line with production goals, rather than an ideal educational system. When stumped on some exercises, you can click to see a related video for guidance. For example, you might dive into angles, and ace the first two exercise questions, but not the third set, so you could watch the video for the third set and return to the questions. The site’s creator has partnered with some California middle school classes. They have inverted learning by assigning the videos as homework while students complete exercises in the classroom when the teacher is available to help. Not all government teachers are excited. Some have asked if there’s a way to slow down the learning, or hold students back. Some non-governmental educators want to go even further by teaching through projects. A project might entail creating a kite and researching rules of geometry and physics and even the atmosphere to produce an ideal product, much like you might have to do during a job. Khan retorts that exercises still have a role in learning. Khan hopes to create a real-world school that won’t group students into grades by age. You don’t need to wait for thatÂ to happen, you can start to move beyond your “grade” today by watching the videos and completing the exercises. Ideally you would learn enough to skip a grade or two or three. You could still socialize and play sports with people your age, since age does make more of a difference earlier in life in terms of social life and activities. Some people might worry about a being a 14-year-old high school graduate. Are you going to go to college at age 14? Maybe. You could attend college and still socialize with people your age or with similar interests who live near your school. You could also travel for a year (or two) or, get this, work. Get some experience working before you attend college to get a better idea of how you might use college to further your career. If your job is going well, or if you started the next best online business, then you could postpone or even forgo college, which is even more of Â a racket that high school, in that it’s designed to pay the salaries of professors who must publish research that attracts federal research grants; education is the second priority. More immediately, you could try to convince your school to use the Khan videos as homework, and focus class time on exercises and discussion. Change doesn’t have to be revolutionary. I went to a private school, and the lectures were often just as boring as in the “government” school. I think a lot of what you’ve got on this site is basically predatory, playing on kids’ vulnerabilities and leading them to make uninformed, potentially really bad decisions like dropping out of school. The fact is, it’s very hard to get anywhere without those credentials, like it or not. We can work on changing that, for sure — that’s a long, long conversation in itself — but it’s irresponsible to put up a lot of the stuff here that you are without additional context. Yes, credentials, such as a high school and college degree, seem to be necessary to get work, unfortunately. I just wonder if someone can enter into an entry level job, that does not require a degree, and after four years be at a better point than one would be at if one had gone to a college for those four years. Also, many tech companies, for a long time, have not required a college degree.